class="single single-post postid-377 single-format-standard wpb-js-composer js-comp-ver-3.6.12 vc_responsive"
When you’re already planning what you’ll order next time before you’ve even finished your meal, you know the restaurant is a keeper. That’s what happened on a recent trip to Dinesty Chinese Restaurant. As we rearranged the platters on our table to make room for another dish we probably wouldn’t be able to finish, one appetizing dish after another was whisked to diners around us. Wait, what was that gorgeous-looking stew? I knew I had to return. The name Dinesty is a play on the word dine, and the restaurant’s Taiwanese owners have put some thought into the dining experience. A white wall with soft recessed lights sets off the modern black tables and chairs, and the mirrored ceiling that’s divided into squares by black beams brings to mind a shiny Hershey’s chocolate bar. But the glassed-in open kitchen is the room’s real focus. 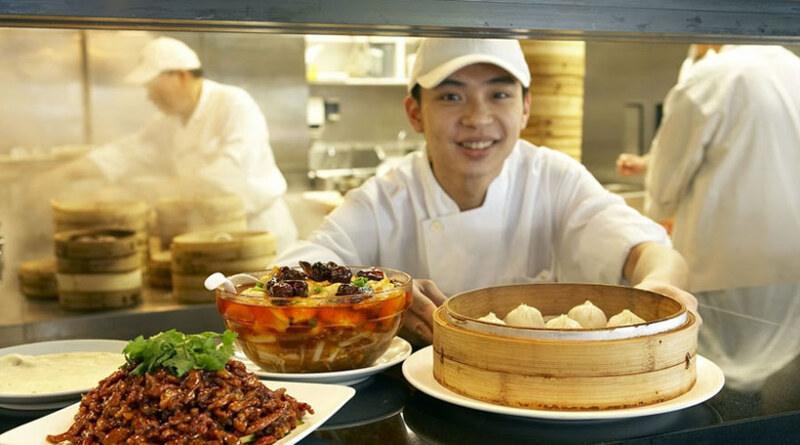 Not only can you see chefs tossing stir-fries, there’s a team shaping dumplings, the restaurant’s specialty. The dishes on Dinesty’s menu are about 60-percent Shanghainese and 40 percent Taiwanese, according to manager Joanne Huang. In a phone interview, Huang told the Straight that items listed on the menu as entrées are generally Shanghainese in style, while the dim sum items (in the “snacks” category) are Taiwanese. In particular, the xiaolongbao take after those popular in Taiwan: the steamed pork dumplings are smaller and more delicate than their Shanghai cousins. Based on my experience, the xiaolongbao compared favourably with the delicious morsels at the popular Din Tai Fung restaurant in Taipei. Thin-skinned and piping hot, the ones at Dinesty were filled with a mouthful of flavourful broth. (Nibble a hole in the wrapper before taking a bite, or risk being scalded!) The kimchi dumplings had only a faint kimchi flavour, too mild for my taste. How does the soup get into the dumplings? Huang said her restaurant’s chefs simmer chicken-and-pork broth for hours, cool it into a gelatin, and then freeze it. Once frozen, the gelatin is diced and added to the fresh minced-pork filling, so that when the dumpling is steamed, the gelatin melts into soup. My husband and I dined on two nights with two different couples, and both times ordering the xiaolongbao was a no-brainer. But settling on the rest of the meal took longer. The first couple were adventurous eaters, and we all wanted to try everything. The second couple described their experience with Chinese food as limited to sweet and sour pork, so we picked out more conservative dishes like hot and sour soup, and requested no MSG. Photos helped to narrow things down, but the long bilingual dinner menu was a bit overwhelming. Although items are numbered, the server asked for the names of dishes instead. We were also constantly trying to flag down a server for basics like water and the bill. However, once we got their attention, the wait staff proved very helpful in helping us put together a balanced meal. On the first night, our server advised us that our party had ordered way too much food; on the second, that our dishes were sauce-heavy, so we needed rice instead of fried noodles. I found some of the dishes too oily, like the Taiwanese fried pancake stuffed with beef and the fried cutting noodles (made on-site) with seafood and pork. The Ancient Boil Chili Fish—the bright red, glistening fish stew that caught my attention the first night—turned out to be swimming in a frighteningly thick layer of chili oil. Yet I couldn’t put my spoon down because the house-made oil was so gloriously fragrant and the dish so complex with chunks of lingcod, Napa cabbage, spring onions, dried smoked chilies, and garlic, garlic, garlic. Dinesty’s take on mapo doufu was sweeter and less spicy than the usual, but satisfying nonetheless. A classic Szechuan dish of cubed soft tofu in a ground pork and chili sauce, my sweet-and-sour friends likened it to a “Chinese Bolognese” and found a new favourite. The shredded pork with hoisin sauce was a nice twist on the pancake course of Peking duck, although we could have used a lot more pancakes for the mountain of pork. Both nights, everyone loved the plump Chinese meatballs. Tucked into a hot casserole dish, the three large ground-pork balls were made meltingly soft with tofu, crunchy with water chestnuts, and rich with shiitake mushrooms, Napa cabbage, and bamboo shoots. Best of all, both evenings the bill came to just under $50 for four people. Each couple departed with leftovers—and fresh ideas for what to order next time.